Calligraphy, of course, has always been an important inspiration for type design. Now, we will turn that around by examining dozens of 20th-century European calligraphic typefaces and use them as the starting points to model our hand-made lettering. In this workshop two important but very different skills will be developed. By reproducing these alphabets by hand, you will fine tune your calligraphic dexterity, sharpening hand, eye, and mind. By referencing these masters’ models and using them as inspiration you foster interpretive ingenuity. These strategies lead you to evolve our own unique and personal lettering styles. The class will introduce modern pen and brush techniques first and foremost. We’ll study the unusual approaches of many different lettering artists. We’ll look closely at some classics like Legende, Neuland, Post Antiqua and Hammer’s Uncials, as well as more the more obscure and eccentric like Georg Trump’s five wonderfully different calligraphic script faces, Oldrich Menhart’s Romans and Uncial, and original letter design by Zapf, Lange, Hoefer and many more. Your handouts will include 75 important fonts plus many modern interpretations — your letterform repertoire will be expanded dramatically. Pen: Pilot Parallel Pen 6mm AND a bottle of non-waterproof ink (Higgins Eternal, etc.) plus your favorite pens you already have. Flat brush: 1/2” W&N 995, plus any other brushes you already have. A tube or two of gouache (WN Indigo or Prussian Blue have the greatest power). A Pentel Color Brush plus any other pointed brushes you want to try or already have – W/N Series 7 or similar, Asian, etc. Pencil (&/or a colored pencil or two — Prismacolors are the best) and ruler. Optional: Graphic white out (Pro–White) &/or light or bright colors of gouache and colored paper, IF you wish to write in reverse. Carl Rohrs has been a commercial lettering artist and sign painter in Santa Cruz, CA since 1977. Teacher of Lettering & Typography and Graphic Design at Cabrillo College since ‘84, and U.C. Santa Cruz Extension. 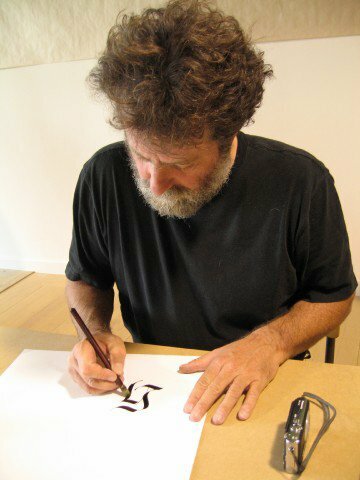 Teacher of modern calligraphy — and occasionally sign-painting and gilding — at workshops and conferences since ‘86 all over the US and Europe, as well as Japan, Australia and South Africa. Studied with Father Edward Catich, Hermann Zapf, Karlgeorg Hoefer among many others. Team teaching partners have included Julian Waters, Georgia Deaver, Susan Skarsgard and sign legend Mark Oatis. Former and current editor of Alphabet, the Journal of the Friends of Calligraphy .